CPAs are integral to the success of any Virginia business. They manage the tax filings, oversee budgets, conduct audits, and create financial projections, among other tasks. Given their vital role in business and commerce for Virginia, there's no wonder that the license receives so much oversight. It's also very difficult to achieve the credential. In fact, each state has its own Board of Accountancy and attendant rules governing how to achieve full licensure. 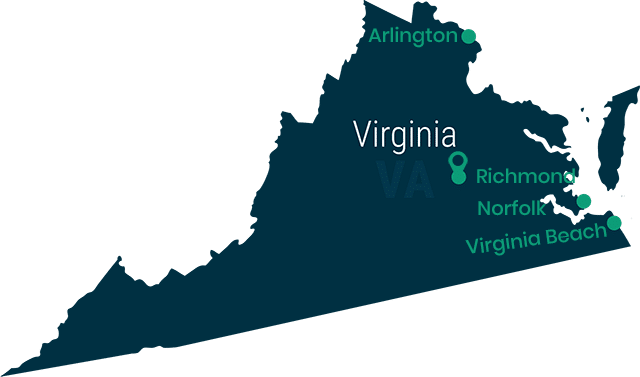 This page is all about how to become a CPA in Virginia. Please refer to this page often as you proceed through the steps to your license. Academic scholarship is the backbone of the CPA credential. While you will learn much while on the job, your college or university experience will set the tone for your later career. There, you'll learn all of the fundamentals, and more. In Virginia, you need a total of 150 semester hours, including a bachelor's degree, to attain your licensure. Included in your 150 hours, you must take a minimum of 24 hours in upper-level accounting and 24 hours in business-related coursework. Keep in mind that courses such as principles of accounting or introduction to accounting will not count towards the 48 hours. Also, if you take a lot of accounting courses, you can use 6 hours to count towards the business requirement. The Virginia Board has made an official recommendation that all licensure candidates have some graduate studies included on their transcripts. The heightened rigor and specific focus of graduate-level courses will better prepare you for your career. Further, these days a graduate degree is more and more common, so if you start working towards that early, your career will likely benefit later on. Every CPA must take and pass all four parts of the Uniform CPA Examination as provided by the AICPA. As part of your preparation, the Board recommends that you download and review "The Candidate Bulletin: Roadmap to CPA Success," which you can find via the AICPA website. The exam is very difficult, so please study hard and consider forming a study group with other aspiring CPAs. To qualify to schedule a test time you must have graduated with a bachelor's degree and have 120 semester hours under your belt. Your transcript should also include 24 hours of accounting coursework and 24 hours of business-related credit. Note that you cannot count introductory or principles coursework in that accounting. To help you determine whether you have the credits required to take the examination, the Board has included a self-evaluation worksheet on its website. They also have a comprehensive Education Handbook to help you plan and assess your education. You can also download this from the Board website. The handbook includes the worksheet. It will take the board up to three weeks to process your transcripts. To attain a CPA license in Virginia, you must satisfy the education requirements, pass all four parts of the CPA examination, attain the necessary experience, and pass the AICPA's ethics exam. Your education must be accredited by a regional accreditation board recognized by the Board and must include 150 semester hours. Your education should include a minimum of 24 semester hours studying accounting, and 24 more studying business-related subjects. The board does not include intro-level courses in this accounting. Along the way, at around 120 hours, you should graduate with a major concentration in accounting. The board advises that you go on to take graduate-level courses to complete the remaining 30 hours. After 120 semester hours, you can apply to take the CPA examination. You will provide the Board with your official, sealed transcripts and all applicable fees. You will soon receive a Notification to Schedule that you can use at a local Prometric location. You can schedule as many tests as you like, but you must pass all four sections of the examination within 18 months. The Board needs to see that you can apply your academic knowledge to real-world clients and employers. Thus, they require one year of supervised experience. Your supervisor should be a licensed CPA and you need to work in academia, industry, public accountancy, a non-profit, or government. To fulfill the requirement, you must account for 2,080 hours that are signed for on the Board's Experience Verification Form. Finally, you need to take the AICPA's Ethics Course, and pass the exam. You can be purchase the course through their website and take it online, if you choose. The exam is open-book and covers the professional ethics expected of a CPA. For every three years of licensure, Virginia requires that its CPAs complete 120 hours of CPE credit, or 40 hours per year. Those hours should include two hours per year in a Virginia-specific ethics course. This is separate from the ethics course you take for initial licensure. The Virginia Society of CPAs is the only provider of the ethics test and the Board allows you until January 31 to fulfill the ethics requirement for the previous year. Once you have your CPA license, give yourself a clap on the back. This is a huge achievement. Going forward, you should consider joining the AICPA and/or the Virginia Society of CPAs. These professional organizations will help you network with your colleagues and even find CPE opportunities. They will be a large part of your professional life, and they even offer leadership positions. Your stellar career will attain new heights through your professional associations.